Instead of bashing Microsoft for deliberately spreading several great lies about Linux, I'm going to write something useful that I hope will benefit those who are planning to buy a netbook. I will be giving simple tips on what brand to choose, the right hardware, the operating system to use, and other important factors that should be considered before making a purchase. I will also be explaining why you should stay away from Windows 7 when buying a netbook. So let's get down to business. Size - I recommend that you choose a netbook with a 10-inch screen size because the display is less straining on the eyes. I also find the keyboard on most 10" netbooks to be a lot more finger-friendly compared to the smaller ones. RAM/Memory - Netbooks are usually loaded with 1 GB or 2 GB of memory. 1 GB of RAM is quite enough but if you have extra money, why not make it 2. Storage - Most netbooks nowadays have 80, 120, or 160 GB HDD, so choose a storage size that fits your needs. Battery - Branded netbooks come with a decent battery. A 3-cell battery can give you around 2.5 hours, 6-cell around 5 hours, and so on. You may want to read the simple ways on improving netbook battery power. 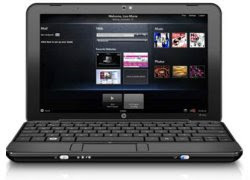 At the moment, a good quality netbook is priced at around USD $350-$450. With Linux, your netbook will run a lot faster since it will be using less hardware resources when compared to Windows. Because most you will probably be traveling around with your netbook, the comfort of bringing an ultra-secure OS with you is priceless. Since netbooks have limited screen real estate, you will need a desktop environment that can help optimize it. A Linux DE like GNOME will allow you to fully tweak the interface to help save some desktop space. You may check out my post on how to optimize a netbook's screen real estate. This is rather self-explanatory, but I would like to point out that using a free OS means spending less and having extra money to upgrade some key hardware components like RAM and hard disk. What's good about Linux is that you have plenty of flavors to choose from. The most widely used distros on netbooks are Xandros, SUSE, Linpus, and Ubuntu Netbook Remix. Each of them has different features so I recommend picking the one that you are comfortable with. Don’t worry; Linux is as easy as using Windows these days. With all the positive reviews that I've read about Windows 7, I still want you stay away from it if you are planning to buy a netbook. Why? Though it's a trimmed-down version of Vista, it is still a resource hog. Like, its minimum recommended RAM requirement is 1 GB. That means you will not be able to get the most out of your netbook if you use Windows 7. Another reason why you should be avoiding Windows 7 is its expensive price. Not to mention the added cost of maintenance; like for example buying anti-virus software. I can go on and on but since I said a while ago not to bash Microsoft or any of its products, I will keep it short and honest. "Spend your money wisely and buy a Linux-powered netbook. Trust me, you will not regret it." You may also like my article about choosing the right laptop/notebook computer. Do you know that every time you upgrade your GNU/Linux box you have to also upgrade (reinstall) all your applications? What a nightmare. Buy a Windows netbook. It just works. Nice article. I bought my laptop from Dell with Ubuntu 8.10 already installed. Including shipping, it only cost $350. It's a low-end, very functional laptop, not a netbook. As for the bit from the other commentator about having to reinstall applications on upgrade, I never had that problem, and I use Ubuntu. Maybe next upgrade it'll happen to me. It's nice to have upgrades available (but not necessary) for free every 6 months, and all I have to do is click "upgrade" in the update manager. Sweet. For the fellow above Adam to say what he has, he obviously has never installed a Linux distro. When you reinstall a linux o/s you basically have a running system with enough apps to get you going. When you install Windows, what do you get apart from the o/s? Notepad? Those updates are there for a reason... On windows it just update the os. In like ubuntu it does it all (OS + openoffice, ...). Time? What about it? That depends on your internet speed, installing it is a matter of seconds. No reboot, no wasting your time for finding updates for applications with linux. No update for you anti-virus, anti-malware, ... And the lag all these anti-stuff brings with it, will even more cost you time at windows. You are not obligated to update anyway. "you have to also upgrade (reinstall) all your applications?" No, just the one that has an upgrade in the queue. I don't see how most of your comment relates to mine. Thanks though for answering the question regarding re-installation of applications. With linux you get very fast performance even with 1gb of ram. Anyone running windows any more needs their head examined. I have Windows XP, Windows 7 and Linux Mint 7.0 installed on my box which has 1 GB RAM. They all perform pretty much the same. My box is almost 7 years old, by the way. As for the bit from the other commentator about having to reinstall applications on upgrade, I never had that problem, and I use Ubuntu. If you do dist-upgrade you'll get all the apps which are in the repositories upgraded. That's great. But I personally use quite a few applications that are not the repositories and after the upgrade I am forced to either go find a version that is compatible with the newer version of Linux or compile it again myself. If you have a bunch of such applications, upgrading them every time you upgrade the OS becomes very frustrating. Having to reinstall your non-repo applications is far from having to reinstall ALL your applications after an upgrade. How many programs have to be reinstalled after a reinstall of Windows? And concerning Win 7, I'm running it now with 768MB Ram and it does very well and anti-virus isn't a cost when there are so many excellent free alternatives. Don't be dishonest, makes you sounds like a Windows fanboy. I'll probably buy a new netbook after Win 7 comes out and I'll dual boot. Win 7 is good enough that it is worth the extra cost and Linux is fantastic given it's cost. What I want is a 10-15 sec max boot up Linux distro....where is that option? Uhh, have you actually tried running Win7 on a netbook?? After you do, I'd be willing to spend my time reading an intelligent comparison. Otherwise, why bother with what you wrote??? My zareason A20 Linux Netbook showed up today, and in fact I am posting from it now. Very happy. Cost $350. Showed up, opened the box, plugged it in, answered 4 setup pages and I was on my way. I am a sys admin, so I need a bunch of tools. So far, everything is already loaded. Came with Ubuntu 9.04 full version not Remix. Does apton cd come into this conversation at all? It makes managing linux data the easiest thing in the world. @alexvinidiktov: unfounded nonsense? You're defending a system that can't properly update itself even with all of your software installed! There is a Lenovo (IdeaPad) out there, too. Compared to an Acer I would choose that one. Lol -- where does this nonsense come from? One of the most attractive and compelling aspects of the GNU/Linux desktop is its package management system as anyone that has used GNU/Linux at all will tell you. Seriously, keep your fingers busy doing something else besides typing. Honestly, it sounds like maybe you aren't using a distro with a large enough repository. I'd be hard pressed to think of more than a handful of apps that I use that don't have relatively up to date versions in Debian, for example. Those few that are, are all closed source apps and require the same sort of re-installation cycle that I have to deal with when using Windows. How many apps outside your repository do you have to install, anyhow? "But I personally use quite a few applications that are not the repositories and after the upgrade I am forced to either go find a version that is compatible with the newer version of Linux or compile it again myself." This is complete nonsense. Could you name these programs? Once it runs on GNU/Linux, will it always run on Linux. I have a game called Koules (http://www.ucw.cz/~hubicka/koules/English/koules.html), the binary of which was compiled in 1995. Guess what - 14 years later, it still works! (Hint, if you would like to run decades old GNU/Linux programs you may need to install the compatibility packages, namely libc5). I am sometimes really amazed how can people say that installing/updating software on Windows is easier than installing/updating software on Linux. I don't know even one way to upgrade/install 100+ applications on Windows in one go without tweaking it first and then deploy it with some deployment software. And even then it is not so straightforward. Not to mention that is not something typical user would be able to do. On Linux? maximum 5 clicks (if it doesn't require extra configuration - if it does add maximum 5 extra clicks). 150 seconds (maximum 300 seconds). Did I mention that on Windows you need to download applications one by one or use provided CD/DVD? And on Linux? Use one single application to update/install thousands of applications. Shall we check the upgrade? apt-get dist-upgrade (you can use GUI too). The same number of clicks as above. On windows? Well upgrade Windows and then repeat the exercise with all application you installed on previous Windows OS version. I am running Debian since 2004. I am running experimental branch of Debian and have currently kernel 2.6.30.6. In have changed graphic card, harddisk and added extra RAM. Did I need to reinstall/reactivate my OS? Of course not. I just put image back (using CloneZilla) and that is it. Have you tried to do the same thing on Windows? Well I did it and not just once. Needless to say that you can't just use Windows on a new hardware without reactivation (this is best case scenario). Usually you need to reinstall the whole system. Windows has some benefits over Linux. Software installation/ OS upgrade is DEFINITELY not one of them! This is area where Windows is still in stone age.